Change your golf glove when it gets sweaty inside. Golfers wear a glove on their non-dominate hand to improve their grip on the club and to prevent blisters. Although rare, some golfers wear two gloves, but typically, right-handed golfers wear a single glove on their left hand, and left-handers wear one glove on their right hand. The lifespan of a golf glove depends on its quality, how often you wear it and how tightly you hold the club. Although you must replace your golf glove when it reaches the end of its useful life, you might need to use more than one golf glove during a round. 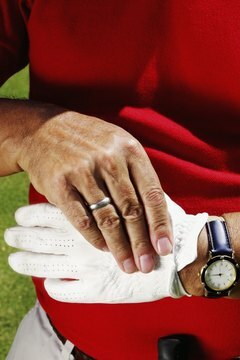 Players change their golf glove when it gets sweaty, is uncomfortable or no longer provides a quality grip on the club. If you feel the need to change golf gloves frequently during a round, keep one or more gloves in your bag. After a few holes, or when your initial glove gets sweaty, put it in your bag and don a new glove. Remember to always remove recently used golf gloves from your golf bag and air them out when you get home. If you play golf frequently, you may need to buy several golf gloves in a season. Doing so can add up to a significant expense. Avoid getting the glove wet. Don't wipe your sweaty forehead with your glove or hold a ball that is fresh out of the ball washer. Remove the glove carefully, gently tugging on each finger. Regardless of how long you have used your golf glove, it's time to replace it if it has a hole in the palm or fingertips, if it has shrunk or is too dirty. During the golf season, your gloves also may get wet from rain or perspiration. Gloves that go through dry and wet cycles can become stiff and worn. If your glove is uncomfortable, find a comparable replacement.